As UFT members, you have rights on the job — rights to professional and fair treatment and to working conditions that help make a tough job more doable. These rights have been negotiated in a give-and-take process with management. It’s important to become familiar with your rights and exercise them. 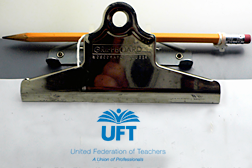 In this section, you’ll find searchable contracts for every UFT bargaining unit plus comprehensive information about health and safety, observations and evaluations, leaves and much more. Find out about incident reporting, theft prevention tips, UFT school safety workshops and services and safety laws and regulations governing schools. Find information about UFT on-site training, site inspections and emergency response as well as a primer on common ailments and building hazards in schools. The current contract for every bargaining unit represented by the UFT is now available on uft.org. Each contract is fully searchable. The teacher contract, in addition, has links to contract tips as well as forms and other related items in the margin. You must be a member of a UFT bargaining unit and be logged onto the UFT website to have access to the searchable version of your contract.